I had leftover pizza crusts in my fridge from the pizza I had made last night, so I thought I would make some more tonight. I guess you could call this pizza the smorgasboard pizza...because I was basically using the leftover ingredients from the week's dinners. I had some garlic hummus, some olives, zucchini, feta cheese, cherry tomatoes...all a perfect combination for a pizza with Mediterranean flavors! Although I usually skip the sauce or spreads on my pizzas below the toppings, I decided that the hummus I would allow tonight, in favor of it's garlicy goodness...and it wasn't spread on too thick afterall. The pizza turned out marvelously and was devoured very quickly! 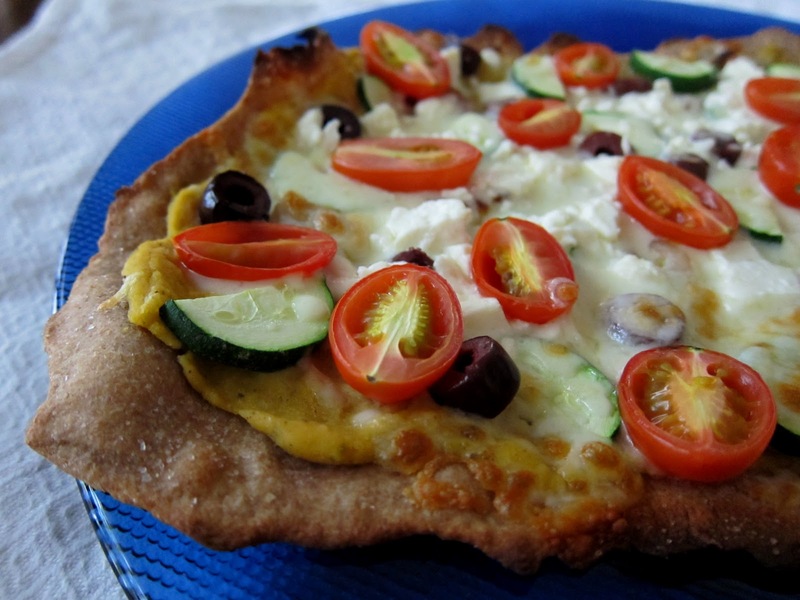 If you have hummus, you should try it on a pizza! To make the perfect pizza, you need a good quality pizza stone. Place the stone on the highest rack in the oven, then crank up the heat as high as possible (500 degrees) at least an hour before baking the pizza. Heat a medium non-stick skillet over medium heat and add the olive oil and onions. Saute until very soft and translucent, then add the garlic and cook for about 30 seconds until fragrant. Add the balsamic vinegar and stir to coat onions. Remove from heat and set aside. To assemble pizzas, place the dough on a piece of parchment paper, spray rolling pin with non-stick spray and roll out as thin as possible (about 10 inches is best) repeat with other crust. Brush the crusts with a small amount of olive oil, over the entire surface. 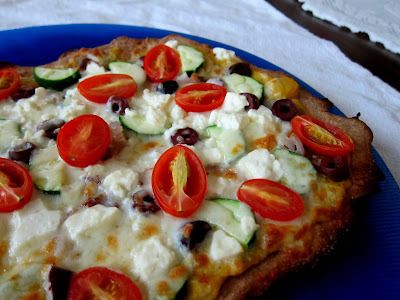 Sprinkle salt and pepper over crust, spread hummus thinly over each, then scatter onions, zucchini and olives over crust, followed by the mozzarella and feta. Scatter the tomatoes over the top. Using a pizza peel, or an upside down sheet pan, carefully slide the dough (keeping it on the parchment) into the oven. Bake for about 3-5 minutes, or until crust is starting to brown and cheese is bubbling. 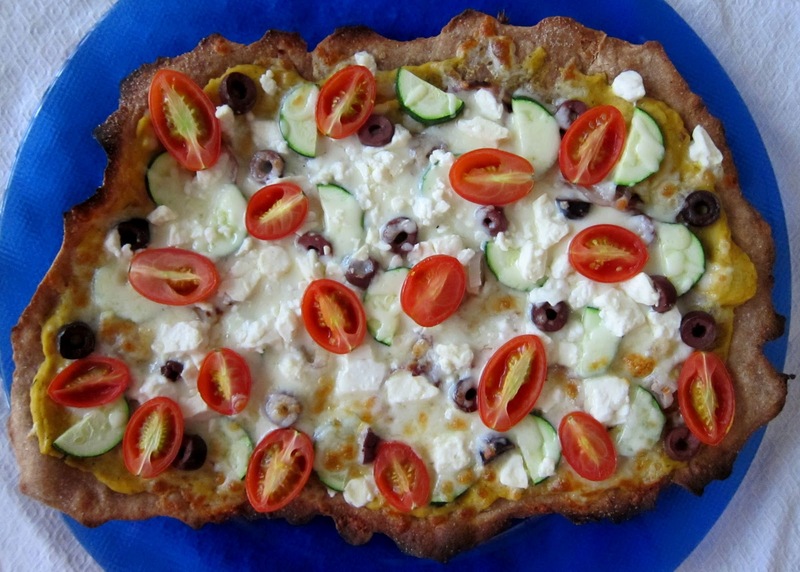 Carefully slide the parchment onto a sheet pan or pizza peel to remove from oven. Scatter the oregano over the pizza and serve!